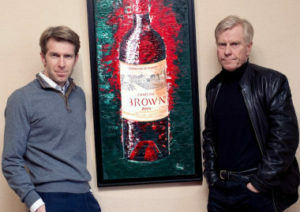 I’ve known Jean-Christophe Mau (left) and his father Yvon (right) for over a decade now, and watched the progress of the family’s Château Brown since they purchased the Pessac-Léognan estate in 2004. Pessac-Léognan, in the Graves region of Bordeaux’s ‘Left Bank’, is a substantial estate of 59 hectares, 29 planted to vine on the region’s famous gravel soils. Pessac-Léognan is unusual among Bordeaux’s top appellations in that almost all estates produce both red and dry white wines. At Brown, 24.5 hectares are planted for red wines and 4.5 ha for white wines, with an average age of 21 years. For the reds Cabernet Sauvignon makes up 55% of plantings. with 40% Merlot and 5% of Petit Verdot. For white wines the vineyards are planted to 70% Sauvignon and 30% Semillon. There’s a slightly higher proportion of new barrels used for the white (50% as opposed to 40% for the red). In 2012 Jean-Christophe added a rosé to the rosta, treated very much like a serious white wine, matured in French oak barrels on the fine lees for a distinctive, gastronomic style. I did not travel to Bordeaux for the recent en primeur tastings of the 2015 vintage, but was delighted when Jean-Christophe sent me samples of the three wines from the vintage to taste. Note that although the rosé is a finished and bottled wine, the white and red are barrel samples. Of the vintage, Jean-Christophe says: “The health of the vineyard has not been so perfect since the 2010 harvest,” describing 2015 as a “Lovely, impeccable harvest,” which chimes with every report I’ve seen that 2015 promises to be an excellent Bordeaux year. (2016) The blend is 65% Sauvignon Blanc and 35% Semillon in this 2015, which has a beautifully expressive nose of juicy, sweeter pink grapefruit and necatrine, and the merest sheen of custardy oak. In the mouth it has a lovely rolling texture, more of that profile of juicy and zesty grapefruit married to something a little more tropical, but then a tightening core of salty acidity and that little grip of oak character too. A very impressive Brown Blanc. (2016) A blend of 70% Cabernet Sauvignon and 30% Merlot, there's a good depth of colour here and the aromas are vinous and rich, black vine fruits, a savoury graphite edge and both some meaty bottom notes and traces of floral top notes. In the mouth its a substantial but fresh young Bordeaux, the dry tannins obviously ripe and the cherry-skin acidity bright, but the solidity and weight of the fruit and already integrated oak is impressive again.